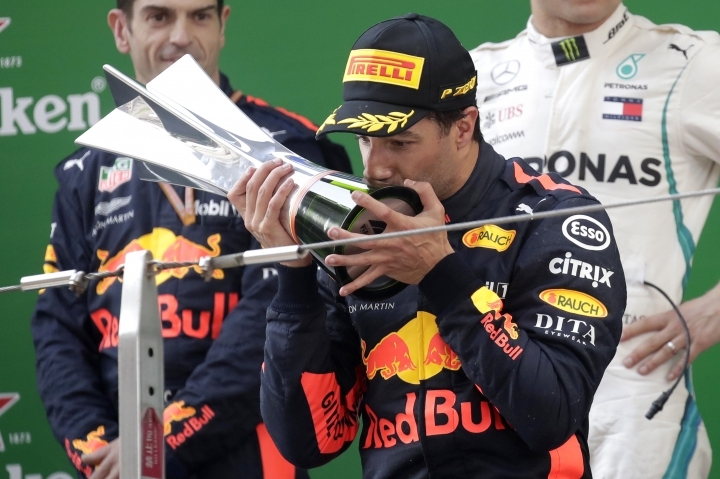 SHANGHAI — Red Bull driver Daniel Ricciardo yanked off his right shoe, poured champagne into it as he stood on the podium, and then drank up to his unlikely victory in Sunday's Chinese Grand Prix. 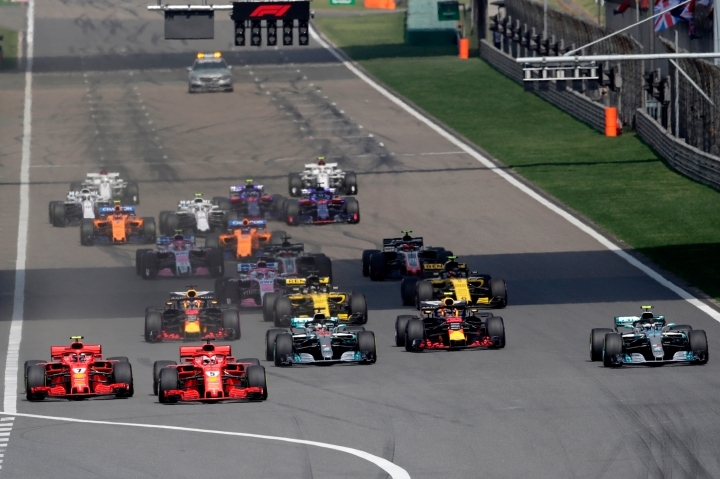 The Australian started from the third row, but took advantage when the safety car came out on the 31st lap to allow him to get fresh, soft tires when the other leaders were running on worn rubber and couldn't get in quickly to change. 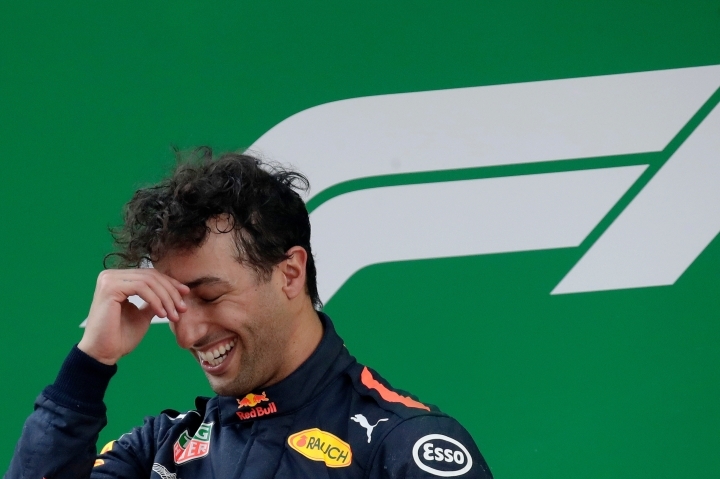 Ricciardo got quicker and quicker and took the lead on the 45th lap of the 56-lap race, overtaking Valtteri Bottas with a dive on the inside past the Mercedes driver. 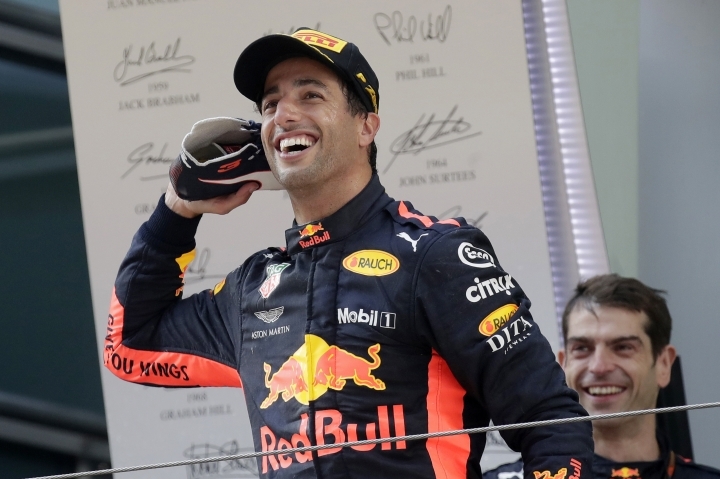 "A lot of time you only get one chance, so I make the most of every opportunity," Ricciardo said. "I don't seem to win boring races. They all are pretty fun, but that was unexpected." Bottas called it a "fair" pass and finished second with Ferrari's Kimi Raikkonen in third. Ricciardo said he knew he had a great chance with the fresh rubber. And he knew he got a bit lucky. "That was obviously giving us a good little bit of grip on the restart," Ricciardo said. "Once I was aware we had the pace, I wasn't going to let that slip." Red Bull's victory leaves the Formula One season in a scramble after just three races. There's no clear favorite and plenty of questions. Mercedes, the power of the last few seasons, has not won any of the first three races with defending champion Lewis Hamilton and Bottas at the wheel. Hamilton finished fourth on Sunday and was never a factor. Sebastian Vettel of Ferrari won the first two races in Australia and Bahrain, but failed to capitalize on his pole position in China. He led for the first 20 laps but fell back, first due to a pit stop and then after a collision with Red Bull's Max Verstappen on the 43rd lap. Vettel finished eighth. Verstappen, who initially finished fourth, was given a 10-second penalty for another brush with Red Bull's Toro Rosso driver Pierre Gasly. Verstappen wound up fifth. Ferrari's Vettel still leads the season standings with 54 points after three races. Hamilton, the four-time and defending champion, improved his season points total to 45. Bottas has 40 points in third place and Ricciardo is fourth with 37. "Saturday and Sunday felt like a disaster from my side," Hamilton said. "I just haven't had the pace since yesterday (Saturday), and I struggled with the car." Bottas acknowledged Mercedes still "has work to do." "It's so close between Red Bull, Ferrari and us," he said. "Just depending on the conditions and whoever gets the tires and the set up right. It's very close depending on the conditions." Bottas said the race "slipped away." "We were going pretty well and we were looking strong until the safety car," he said. "It kind of felt like we deserved a victory, but not today. That is racing. These things happen." Nico Hulkenberg of Renault was sixth followed by Fernando Alonso of McLaren. Vettel, Carlos Sainz of Renault and Haas' Kevin Magnussen rounded out the top 10. 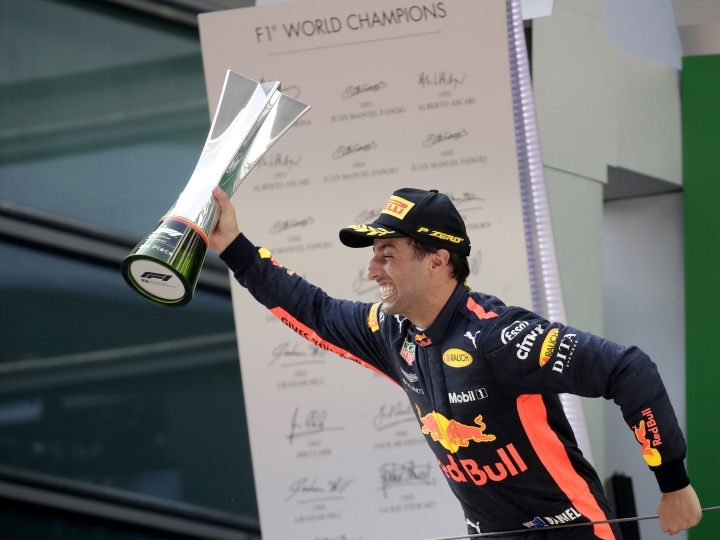 This was Ricciardo's sixth career win, and his first since a victory a year ago in Azerbaijan, the venue for the next race in two weeks. 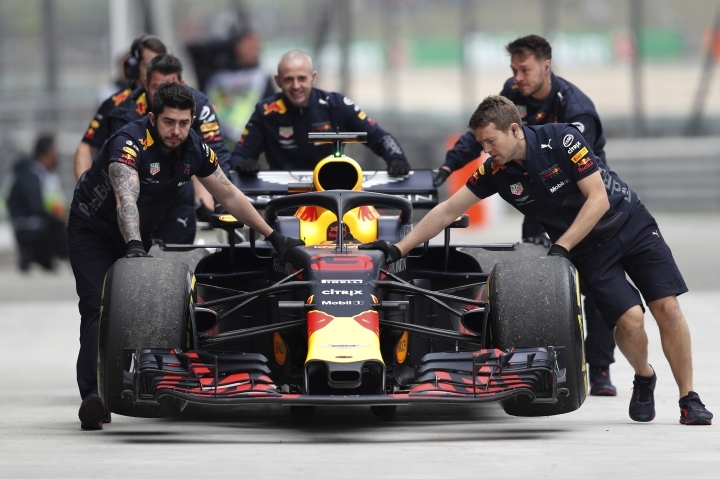 In Bahrain a week ago, Ricciardo and Verstappen were out after the first several laps on a frustrating weekend for Red Bull. "This sport's crazy," he said. "A week ago I was with my head down after two laps; frustrated at the sport, frustrated at all the variables that are involved in the sport. Sometimes I question why I chose this sport. It does get you down a lot. But then you have a day like this it's worth all those bad ones."